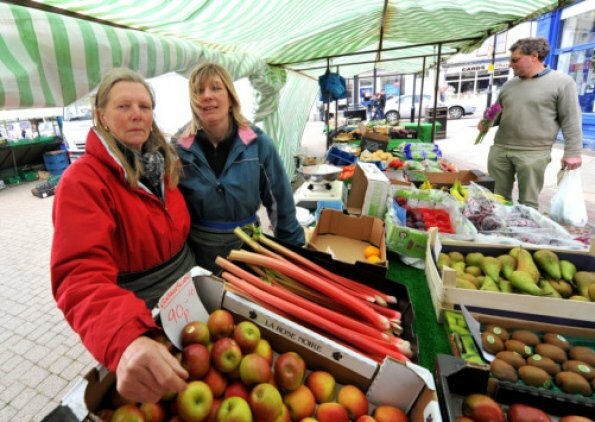 Carol Elsden, who has had a stall on the Stowmarket market for 40 years is retiring. Pictured with her daughter Mary Hughes. Stowmarket's longest running stallholder has decided to call it a day after selling fruit and veg on the market for 40 years. Carol Elsden, 67, from Kettlebaston, began working on her stall in 1972, originally growing most of the produce herself. But after years of hard toil without a single holiday, Carol has decided she wants more time for herself and her family. She said: "It was a fruit and veg stall when I started but we used to grow most of the veg ourselves back then. "We grew tomatoes and salad and a few acres of potatoes - all sorts of stuff. "I stopped growing so much over the last few years but I still tried and buy my produce as local as possible." Carol's husband Douglas helped her grow the produce for the stall until he died two years ago. On Saturday May 4 Carol packed up her beloved stall for the last time. Carol said although she loves seeing her friends on the stall, she felt now was a good time to take life a bit easier. "The best thing about running a stall is you make lots of friends," she said. "They are not just customers, they are friends - you see many of them grow up. "I am just looking to take life a bit easier, have some time out and have a holiday. "I have never had a holiday since I started. "The market has changed over the years, Stowmarket used to be more busy and the traffic went right through the town. The market was full of stalls, but not today." Market Officer Chrissie Day said Carol would be sadly missed. She said: "It is sad to see her go after so long but 40 years is a long time standing in the market in all weathers. "She was our longest running stall holder. "I am sure I will have people coming up to me asking where Carol is for month to come. "She was always the first one to get here in the morning - a real character on the market."